Regardless of religion, practitioners of all faiths have an altar of some sort, a dais or portal through which they make a connection with the divine and take another step towards discovering their true nature. For Buddhists, the altar forms the focal point of their practice and whether large or small, it is one of the first things a practitioner sets up when they become committed to deeper spiritual practice. Understanding the purpose of an altar is therefore important to establishing one. Contrary to popular belief, a Buddhist altar is not about idolatry or the worship of a deity in order to be granted boons or have our wishes fulfilled. A Buddhist altar is used by the practitioner to purify negative karma, and to generate merits which will create the causes for us to have conducive conditions in order to further our spiritual practice. For higher Tantric practitioners, the altar also functions as an aid for visualisations. The Buddha image (whether in 3D statue form or 2D thangka form) takes central position on the shrine, and it is an excellent visual cue for the complex meditations required in higher Tantric practices, for example in the practice of Yamantaka who possesses nine heads, 16 legs and 34 arms, each bearing a different ritual implement. Thus the altar becomes a reminder of the qualities the practitioner is trying to achieve and what is possible when we move closer towards our spiritual potential. Altars can vary greatly in terms of how elaborate or creative they are. Our personal shrines should be in accordance with our lineage, and reflect the deities we rely on and the practices we do. The simplest altar is an image of the Buddha or our Yidam (meditational deity), or an image of our teacher with some simple offerings laid out before it. 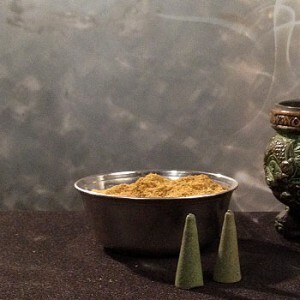 These offerings can range from something as simple as a bowl of water or a candle and some flowers, to more elaborate layouts involving sets of offerings with an esoteric significance. A typical Buddhist altar has representations of the Buddha’s body, speech and mind. Our body, speech and mind are the three doors through which we create merit, so when we offer supplications towards representations of the Buddha’s body, speech and mind, we are creating the causes to develop the same qualities as the Buddha’s body, speech and mind i.e. to become a Fully Awakened One ourselves. On a Buddhist altar, the central position is usually reserved for the Buddha’s body, in the form or representation which is given the highest priority in the student’s practice. 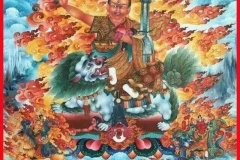 This can be represented by an image of any enlightened being, for example Shakyamuni, Tara, Manjushri or Lama Tsongkhapa, in the form of a statue, thangka (painted image) or tsa tsa (a votive tablet or plaque). The body of an enlightened being possesses the 32 major and 80 minor characteristics which are physical attributes representing the culmination of three aeons of practice and virtuous deeds. Therefore when we make offerings to an image of any Buddha, we are invoking their blessings based upon their practice over countless lifetimes which resulted in their full awakening as an enlightened being. Their placement in the central position on our shrine represents the significance of their role in our practice, as the originator of the teachings we rely on to progress on our spiritual path. It is an expression of our gratitude and recognition of their qualities, understanding that if we follow the teachings they have laid out for us, we will be able to accomplish these qualities too. 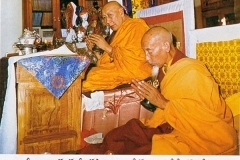 In general, on a Buddhist altar, the space on the left side of the shrine is normally reserved for a Dharma text, representing the Buddha’s speech. The Dharma text is revered because it represents the entire corpus of teachings which will lead us on the path towards ultimate liberation from all forms of suffering. The right side of the shrine is reserved for a stupa, a votive mound-like structure representing the Buddha’s mind. 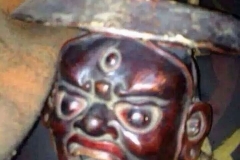 Instead of a Dharma text and stupa, some practitioners may choose to place images of other Yidams on the left side of their shrine, for example their Tantric Yidams like Vajrayogini or Yamantaka. 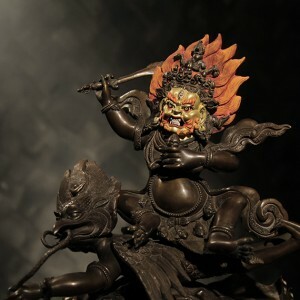 They may also reserve the right side of their shrine for images of their Dharma Protector, for example Dorje Shugden, Kalarupa or Palden Lhamo. We can also include an image of our teacher on our altars. This is usually placed in a prominent position, either in the centre of the altar in front of the Buddha image, or hanging on the wall behind the shrine. Including an image of one’s teacher on the altar makes it easier to visualise our Yidams and Guru as one, as a potent way of empowering our meditations with the blessings of our Lama. 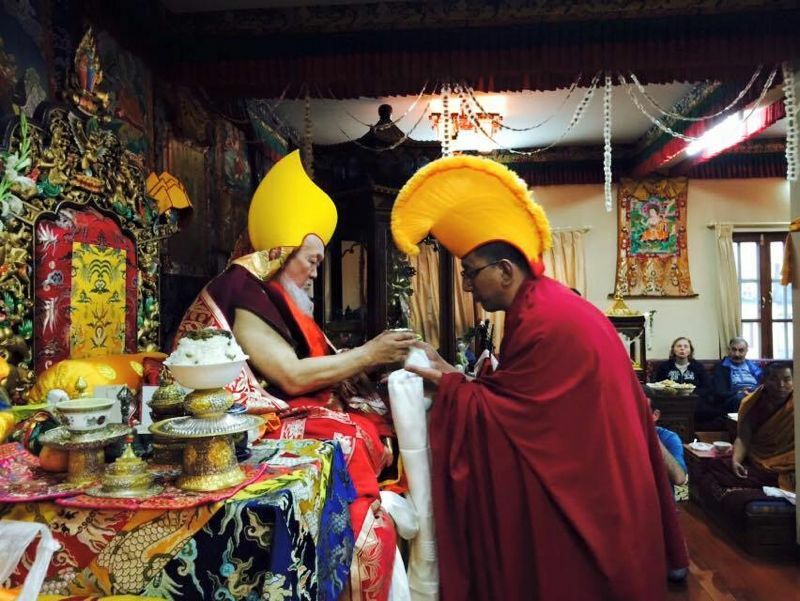 It is also a powerful reminder to generate gratitude for our Lamas who make the Dharma accessible to us through their teachings and through example. As this gratitude arises, so too does faith in their methods and instructions. If there is space, we can also include images of our lineage Lamas, to tap into their blessings so that one’s practice will be successful. 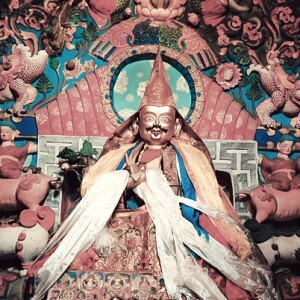 It is traditional for Tibetan temples to house the Dharma Protectors’ shrines in a separate room or building. 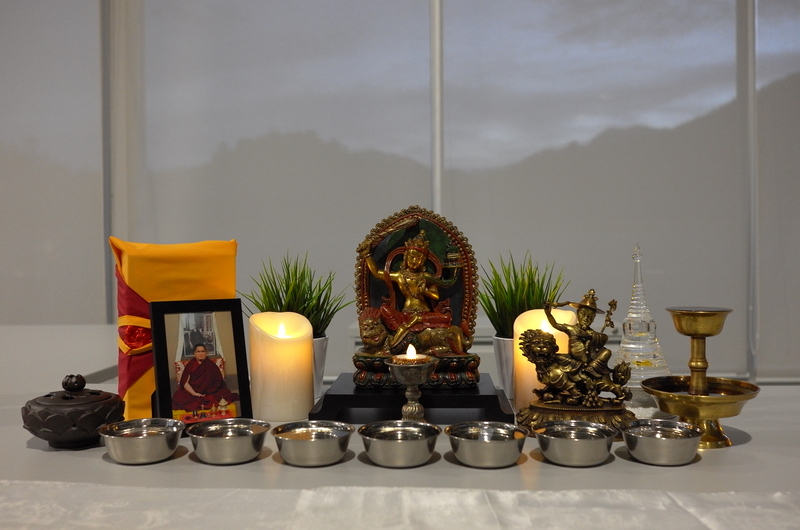 Due to space constraints however, it is not always possible for lay practitioners at home to have a separate altar dedicated to their Dharma Protector. 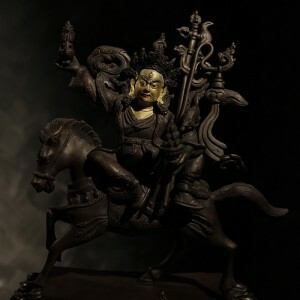 Accordingly, lay practitioners may incorporate an image of their Dharma Protector (in this case, Dorje Shugden) into their main shrine at home, by placing the image of Dorje Shugden on the right side of the shrine. If space is not an issue, then lay practitioners are encouraged to follow the tradition of the temples. 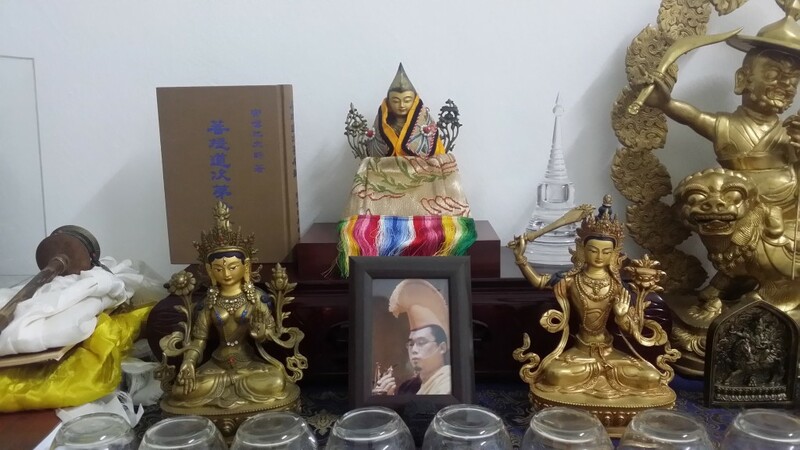 One can have a separate shrine dedicated to Dorje Shugden. 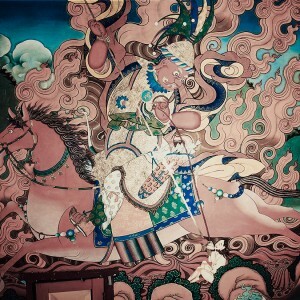 In this case, the central image on the shrine is Dorje Shugden; behind and above Dorje Shugden, the practitioner should place an image of their root or lineage lama. 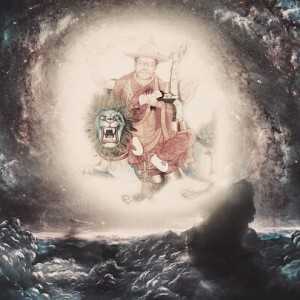 Note that Dorje Shugden, as an emanation of Manjushri (the Buddha of Wisdom) is an enlightened being who resides in great bliss and emptiness, and can therefore be relied upon as a Yidam. Thus although it is not traditional, his form can take central position on the main altar of our homes. 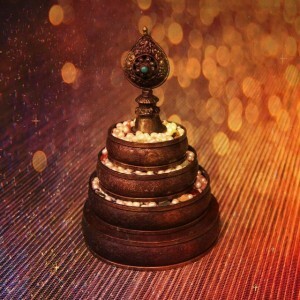 In the same way there is a prescribed approach to setting up an altar, there is also a prescribed approach for the placement and type of offerings we make on our personal shrines. Buddhists are encouraged to set out offerings on the altar, to generate merits by making offerings to the Three Jewels, and to generate the causes to cut our attachments to worldly things that we find pleasurable. The way we lay out our offerings can become a meditative practice in itself. For example, water offering bowls should be placed one rice grain apart, and the water is poured to the level of one rice grain below the rim of the bowl. The concentration necessary to achieve this perfectly becomes a training in meditative concentration for the practitioner. Water for drinking: Offering water for drinking symbolises the teachings and knowledge that the practitioner has ‘drunk’ (received) from their teachers. It generates the causes for the auspicious results of all virtuous causes and conditions. Water for washing the feet: In ancient India, it was customary for the host to wash the feet of the honoured guests, e.g. the Buddha or a King. Offering water to bathe the feet symbolises purification of our negative karma and obscurations, and generates the causes for us to develop humility. Flowers: Offering flowers creates the causes for us to realise Samsara’s beauty and its impermanent nature, and for us to be reborn in pleasant environments that are conducive to spiritual practice. Incense: The tradition of offering incense, to purify the environment and to invite the Buddhas into our environment, originated with Magadha Sangmo. 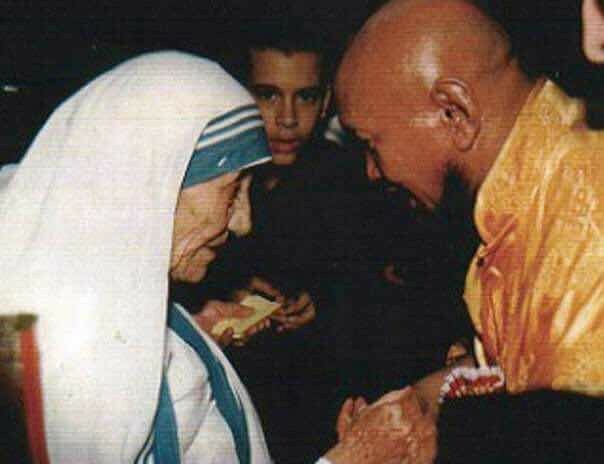 She was a female disciple of Buddha Shakyamuni himself and the first incarnation of H.E. the 25th Tsem Rinpoche. 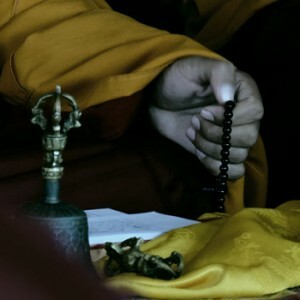 It is said that monks who hold their vows well emit a sweet-smelling fragrance. 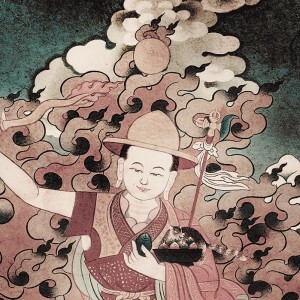 Offering incense thus creates the causes for the practitioner to hold the vows well, thus purifying tremendous amounts of negative karma and accumulating vast amounts of merit to support one’s practice. Light: Like a light dispels the darkness, offering light generates the causes for the practitioner to develop wisdom which dispels the darkness of ignorance. Light offerings can be made in the form of candles, butter lamps, oil lamps or even electric / battery-powered candles. 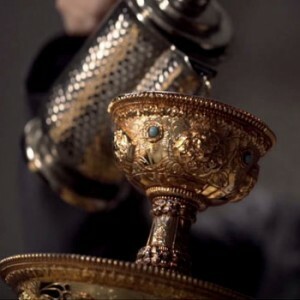 Perfume: Offering perfume purifies the practitioner’s habitual patterns of aggression, ignorance, attachment, and generates causes so that the outer environment may become purified and perfected. Food: When the practitioner offers food, it is a direct antidote to one’s attachment to pleasurable foods and substances. Offering food generates the causes for sustenance and longevity. 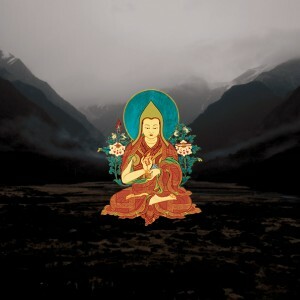 Music: When offering music, the practitioner generates the causes to achieve the Buddha’s wisdom nature, and attain compassion that arises naturally from the wisdom mind. Overall, these eight types of sensory offerings represent the practitioner’s attachment to the five senses. These five senses, when uncontrolled, result in the practitioner creating karma which perpetuates the cycle of death and rebirth. Thus when these items are offered up to the Three Jewels, the practitioner generates the causes to gain control of their five senses. In developing renunciation, they stop creating the karma which will lead them to take continuous and uncontrolled rebirths in samsara. At home, practitioners can offer any amount of water they wish, from one bowl of water to multiple sets of seven bowls each. However, for practitioners who wish to engage in Tantra, they should aim to make at least 100,000 water offerings in their lifetime, as part of their preliminary practices (sngon ‘gro). Doing so will generate a vast amount of merit for an easier livelihood and for the practitioner to develop a clear mind that absorbs the Dharma easily. Those who wish to make more elaborate offerings can make offerings of medicines, dried herbs and anything they themselves find pleasing. Great masters also recommend offering a mandala set on the altar, as a method of generating a vast amount of merit. The mandala represents the entire universe according to the Buddhist worldview. The mandala set itself consists of a round base or plate and three or four concentric rings, and is usually filled with semi-precious stones, grains or beans before the set is crowned by a symbolic victory banner. Aside from offering the mandala set on the shrine, one can also perform the mandala offering ritual while reciting the long mandala offering prayers. When offering the mandala, the practitioner visualises that the universe (represented by the mandala set) is filled with the most precious and beautiful items. In offering these symbols of their attachments and desire up to the Three Jewels, the practitioner generates vast amounts of merits to realise that what they find pleasing and attractive is, in reality, free from any kind of inherent value and is impermanent in nature. Upon gaining this realisation, the practitioner finds it easier to cut any attachment to these items. What has been described above is the traditional layout for altars, and the traditional method of making offerings. However, as with any Dharma activity, what generates the most merit is anything that is offered sincerely. Once our altar has been established, what is most important is how we maintain our altars. The act of making offerings, as well as maintaining our altars should be approached as a meditative practice. With the correct motivation and visualisation, taking the care to set out our offerings beautifully and keeping our shrines clean will generate a tremendous amount of merit for our practice. 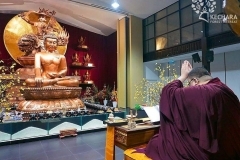 According to the Lamrim, when cleaning the shrine we should visualise that our altar is the same as our mind, in the tradition of Chudapanthaka (Tibetan: Lam Chung), a disciple of Buddha Shakyamuni. Known to be extremely dull but very devoted to his teacher, Chudapanthaka was unable to retain any of the teachings given to him by Buddha. 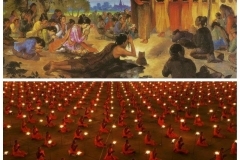 With great compassion, the Buddha thus instructed him to sweep the gathering place of the monks every day. While sweeping the floor, Chudapanthaka was instructed to visualise the floor as his mind, and the act of sweeping to represent the removal of impurities from his mindstream. 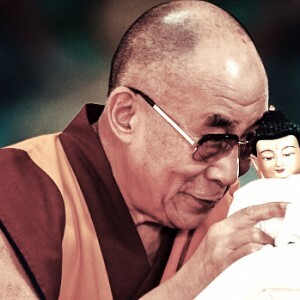 The Buddha also instructed him to recite the mantra “DU PUNG DRIMA PUNG” (Tibetan: “I am removing dirt. I am removing dust”) as he swept. He was given no other practices or teachings but this. 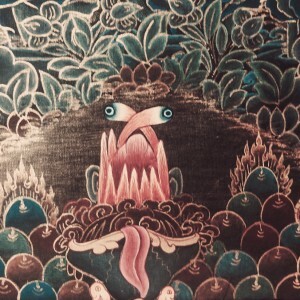 So dull was he that Chudapanthaka struggled to remember even the mantra. No sooner had he memorised “DRIMA” that he would forget “DU PUNG” and so on. 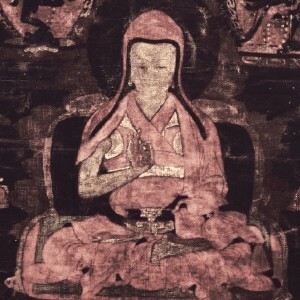 Chudapanthaka however, persevered and after a long period of sweeping, developed great clarity in his mind and eventually became an Arhat in his lifetime. Chudapanthaka’s story demonstrates that sincerity, guru devotion and purification are powerful, potent paths to attainments. Thus if visualised correctly, then the act of cleaning our altars can become a powerful purification practice. 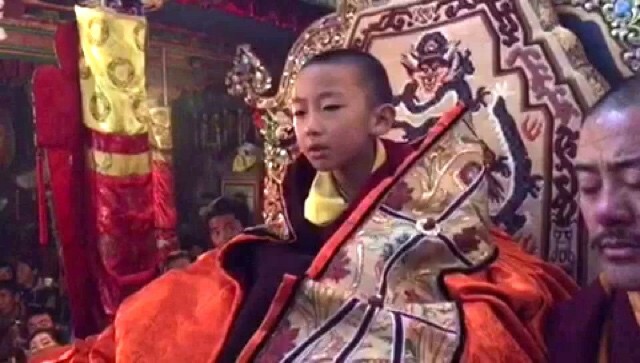 We can follow Chudapanthaka’s example and recite the same mantra prescribed by the Buddha, or recite Vajrasattva’s mantra as we clean our altars. 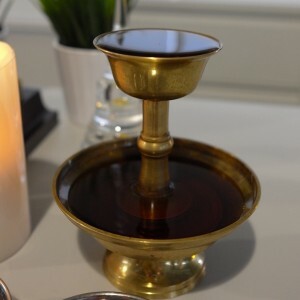 For reasons of inauspiciousness, we should be mindful not to leave empty offering bowls upturned on our altars, or any dirty and rotten offerings on our shrines. It is said that doing so will attract spirits to come and remain in the environment, to partake of the offerings. We can also develop a condition known as drib whereby our mind becomes clouded and drowsy whenever we encounter Dharmic and virtuous circumstances like teachings, thereby presenting an obstacle to our spiritual progress. Thus when unused, our offering bowls should be cleaned and turned over, or kept away. If we plan to be away for an extended period of time, then all offerings should be cleared and kept away until our return. After all, if making offerings on and maintaining our altars can be used as a meditative practice, then keeping it clean even in our absence is important too. 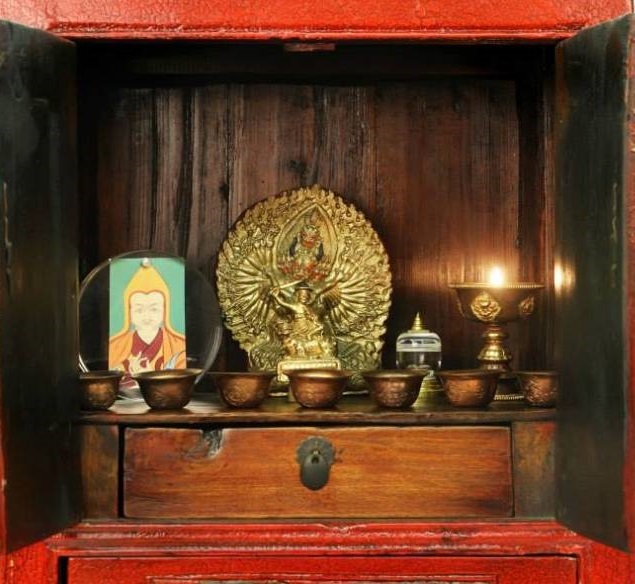 This artcle on setting up altar is simple yet practical and easy to follow step by step guides for many Buddhist practitioners, especially the beginners. Thank you. Yet another informative article with practical things to bear in mind when setting up and maintaining the altar as part of our practice. Further, having any Buddha images in the vicinity will also bless the environment with positive energy. It can also plant seeds allowing for imprints of enlightenment to be etched into the consciousness of those coming into contact with the Buddha images (to be able to practice Dharma in future). 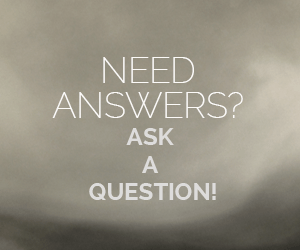 I came across many people who asked me is it very complicated to set up an Altar? Actually it is not, nothing complicated about, everything we put on the Altar, it has the specific meaning, and an Altar set up can be as simple as offering a few bowls of water. This article explained very detailed and yet very easy to understand the meaning of each and every offerings. Thank you Admin for putting up such beneficial article for the new practitioners who wanted to set up their first Altar. This is a very useful guide for anyone who wish to set up an altar. No matter how big or small the altar going to be set up, sincerity is the key. Very helpful article for beginners. Having a basic Buddhist altar is not something difficult to achieve and can be done by anyone. 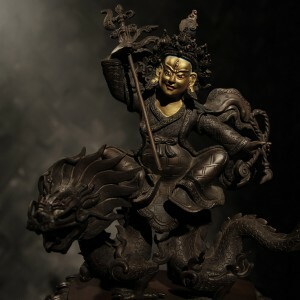 On top of that, for those who may find it difficult to obtain a Buddha statue, this website also provides many high resolution pictures available for download so that we may print and frame it up to be used on our altar. Everything is so conveniently laid of practitioners. May many people create their own private Buddhist shrines and see the benefit of Buddhist practice reflect in their lives. 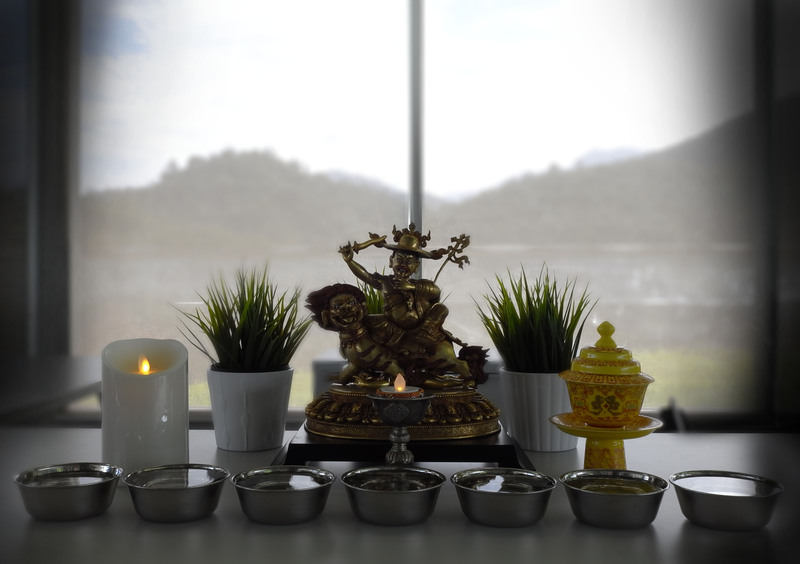 What I like most is the part where our altar can be simple and beautiful or full of Buddhas and offerings. Due to traveling or constraint places, we may choose the best way to setup according to our needs. Especially if we have an extra room in the house and dedicate it to be an altar room! And the best part is, there is no right or wrong but our motivation. When I first saw a Tibetan altar setup, I was so attracted to it. I loved the way the Buddhas ‘looked’ and the colorful beautiful offerings. From then on, I love buying offerings for my altar. From Buddha images, big or small to colorful precious stones. This topic explained a lot, especially the meaning of offerings and the cleaning mantra. Informative and easy to understand. A practical guide to setting up an altar according to Tibetan Buddhist. However the symbolism and meaning behind the entire altar is anything but simple. I do not think most of us can really grasp the full meaning of this symbolism behind an altar but it doesn’t mean we cannot follow the guide in setting up one, the practice of offering and maintaining one. Perhaps the full meaning will be revealed later once one gets into the practice. His Eminence Tsem Rinpoche makes beautiful offerings on His altar with elaborated decorations using materials of the finest quality. 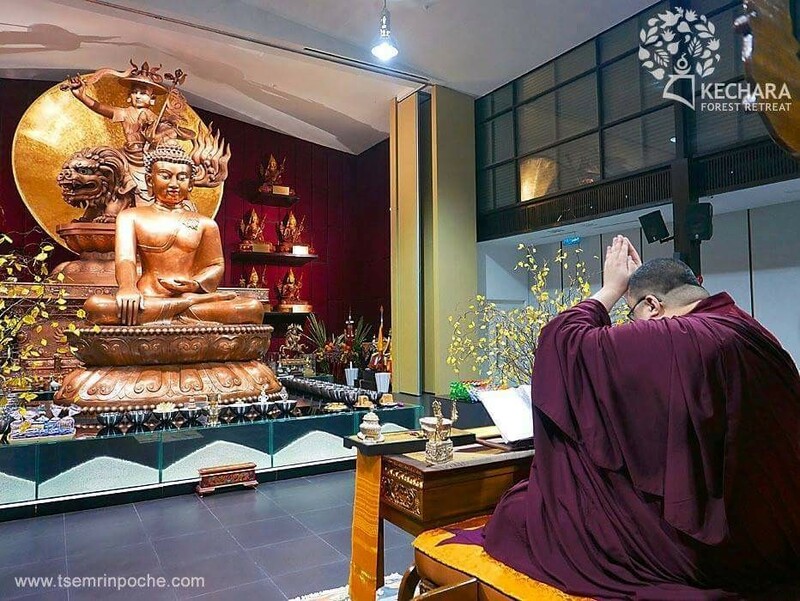 By doing so Rinpoche generates much merit to Kechara for the growth in dharma teaching and practice to benefit as many people and sentient beings as possible. As a rookie who is practicing Dharma,who wanted to set up an altar and wish to have a connection with Buddhas, I’ve learned most of the essences of setting up an Tibeten Buddhism altar by just reading this article. I find it comfortable and easy to read and understand. It’s important for one to set up an altar to start their practices. This articles give an explanation from starting preparation of every offering up to maintaining them is for our understanding to make our practice more meaningful. What important when we do our offering is our motivation and sincerity. We can offer the most expensive items but if we are not setting a right motivation it will not give any result. Instead if we are sincere and we give the best we will achieve the ultimate result from our practice. I had came across many people asked me about setting up an altar, and many of them always think that it need lots of money to setting up an altar. The actual fact is we can anytime set up a simple altar with little money. Sometime people asked where you get the information from because they don’t have confident the information given to them is correct. This article is good to prove to them what I said. The part I like very much is the meaning of the each offering. 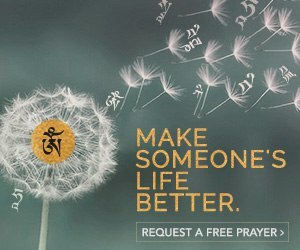 This make I feel more meaningful when doing my offering. I used to have a simple altar. Just Vajrayogini Tsatsa gifted by Rinpoche and a very small DS tsa tsa, 8 little cups of pure water and incense that’s all. I remembered once Rinpoche told us that He rejoice for some of His students, their house became smaller and their life simpler but the altar became bigger with many Buddha statues and with lots of offerings to collect merits everyday. I love the story of Chudapanthaka as it shows that enlightenment is possible for all who have faith, a sincere heart, perseverance and strong Guru devotion. It also tells of how skillful a Guru like Buddha is able to help his students gain liberation, even the dullest of the lot. All one needs is to have full faith and fully rely on one’s Guru. Thank you for the useful guide to set up a place for our daily practice. It’s explained so well that I realise each part of it plays important role. I have just set up an altar in my new house, which I have attached a picture here. This altar is the best altar I have so far after moving a few places, as I understand the significances this time. Thank you for sharing the altar set up as its easy and very clear on what we need to do and how. Very good for beginners as well. We have more understanding on what we are offering to the Buddha as well. Nice! This is such a comprehensive illustration of how we can set up our Buddhist altar. We can start with a photo image of a Buddha deity if our space is limited. Interestingly the longer we practice, the bigger our altar will become. Our altar is like our spiritual home, as time goes by we will expand it. When we invite a bigger Buddha statue, we can give a way the smaller one or move the smaller one to other area in the house so many beings can be blessed by the Buddha image. 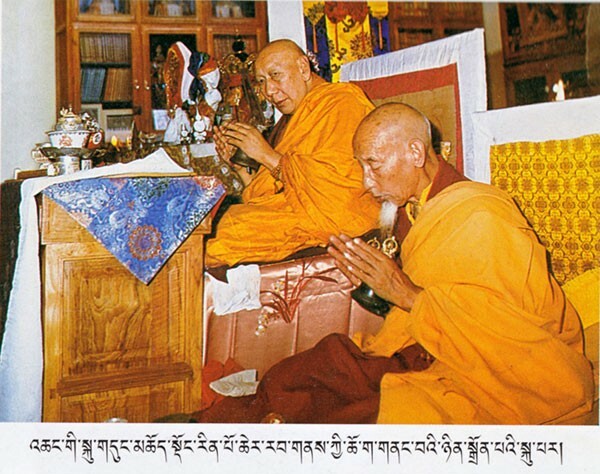 This is a complete write up on all the items needed to setup a Tibetan Altar. 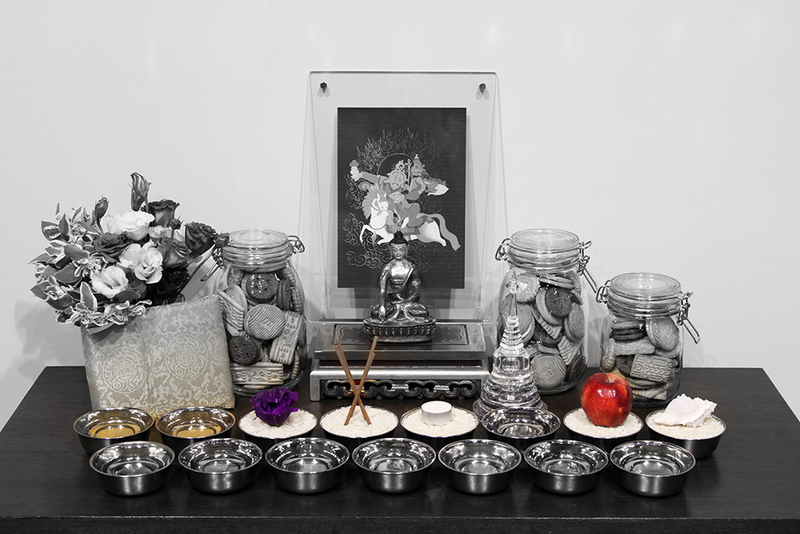 It offers us a choice between a simple altar, a general altar and/or a protector altar dedicate to Dorje Shugden. 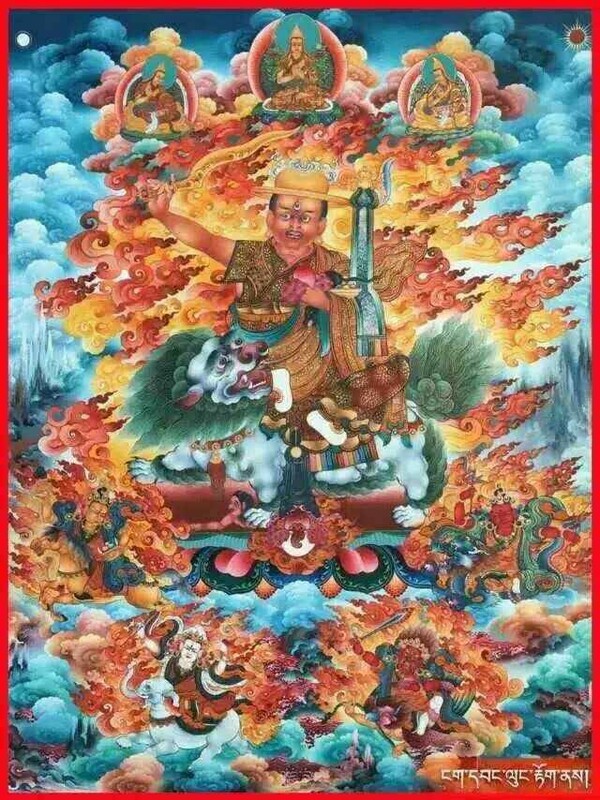 It is worth to note that Dorje Shugden, an emanation of Lord Manjushri who is enlightened, can take central position on the altar. In this write up, all the necessary offerings are listed down clearly so that there will be no mistake for us practitioners. We must also remember to upkeep our altar always in a clean and neat setting. Reside Du Pung Drima Pung as a meditation practice when we are cleaning our altar. Thank you for this write up. 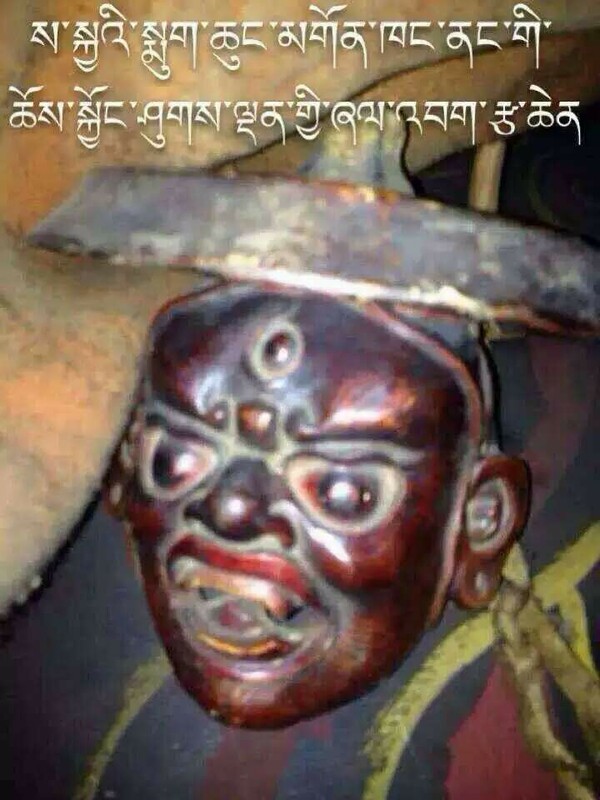 It is worth keeping for reference and a must-share for all Tibetan Buddhism aspirant. very helpful and informative article for anyone who is setting up their altar. A good guide with detailed explanation to what should placed on the altar and their significant. 1. the altar forms the focal point of the practice. 2. the altar is an opportunity to the practitioners to purify negative karma and to generate merits. For higher Tantric practitioners, the altar also functions as an aid for visualisations. 3. to create the causes to develop the same qualities as the Buddha’s body, speech and mind. However, those are sincerity for the spiritual practice should find a qualified guru to give the correct guide in achieving attainments. Thank you for posting this article. I always find the altar for Tibetan tradition very “complicated” and has many things, but don’t really know the meaning behind it. This article is good because it gives a clear and concise explanation as to what to do as beginner. Also, I didn’t know altar can be so “flexible” for example, we can use a statue of just printed image to replace statue. It is indeed quite an eye opener. The story of Chudapanthaka (Tibetan: Lam Chung), a disciple of Buddha Shakyamuni is truly motivating for dull student like me! It goes to show with devotion and perseverance, the cleaning of our altar, we can purify our negative karma and gain spiritual attainment. Thank you very much for sharing this story here. Extracting the story here to share: “Known to be extremely dull but very devoted to his teacher, Chudapanthaka was unable to retain any of the teachings given to him by Buddha. 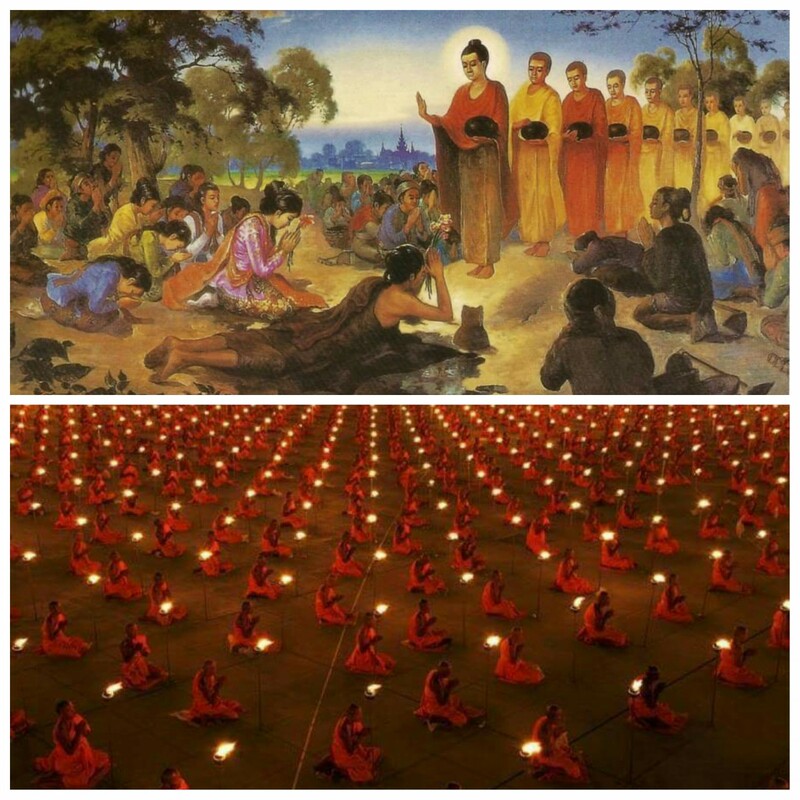 With great compassion, the Buddha thus instructed him to sweep the gathering place of the monks every day. While sweeping the floor, Chudapanthaka was instructed to visualise the floor as his mind, and the act of sweeping to represent the removal of impurities from his mindstream. The Buddha also instructed him to recite the mantra “DU PUNG DRIMA PUNG” (Tibetan: “I am removing dirt. I am removing dust”) as he swept. He was given no other practices or teachings but this. What is used to fill up the small bowls on the altar picture .Is it pearls ? This article of setting up and maintaining an altar is very useful for practitioners whether they are new or experienced. The article is great source of information because in addition to containing information on how to set up an altar, it also explains about the meaning of offering and the dos and don’ts when having an altar. For example, we cannot have offering bowl turned up because it will attract spirits to come and remain in the environment. We must also keep our altar clean to generate tremendous amount of merits for us. I recommend this article to anyone who is interested to set up an altar or just to check whether your existing altar is set up correctly. Love this altar setup 101. Basic and yet have enough information for us to understand why we do such offerings. And, as we progress and our altars get bigger, we still can refer to this article to guide us. Greta job. 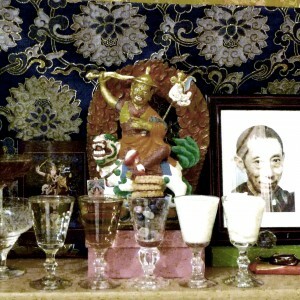 I recalled the time when Rinpoche asked me to set up my first altar about 12 years ago. 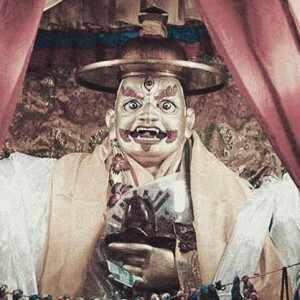 Through his clairvoyance, Rinpoche knew that I have a Tara statue at home that I kept hidden on the shelf. 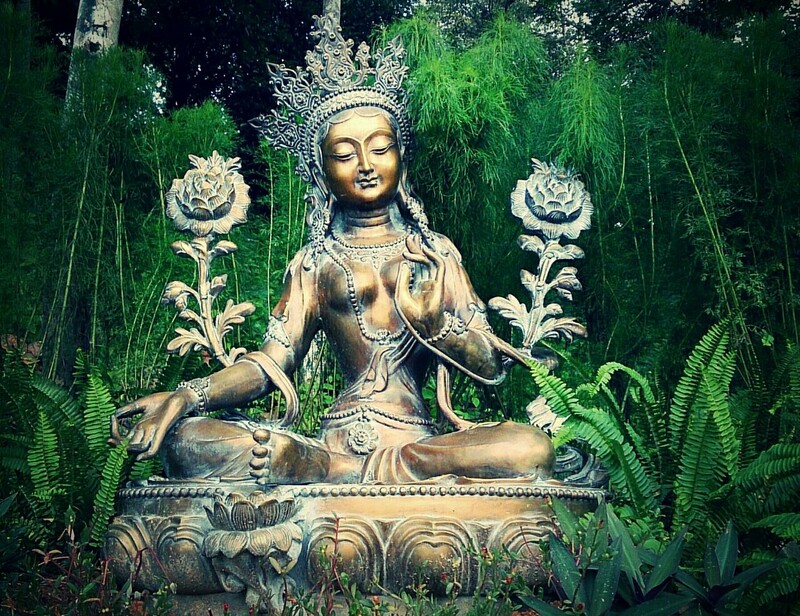 Rinpoche asked me to set up an altar for this Green Tara statue, and I agreed. Although at the time I was not yet a student of Rinpoche, I was very happy because deep down inside, I knew that I have met with someone special and very charismatic. 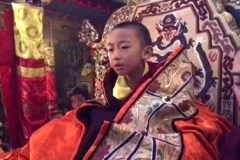 I started to do my practice, and Rinpoche asked me to do purification practice. 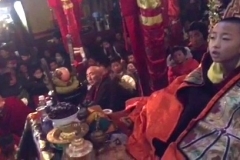 Rinpoche asked me to do 100k prostrations, 100k Vajrasattva mantra, 1 million Tara mantra. It took me about four years to complete the Tara mantra. 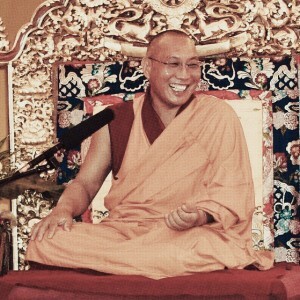 Since then Rinpoche has given me a string of assignments and Dharma work. There were many times when I failed or choose not to do the assignments due to my laziness. But Rinpoche has never given up on me still, and I keep getting many chances to do good. When I really follow the instructions, although it seemed impossible at first, many good things come in the end. When I chose to defy the advice, then I lose out on many things. 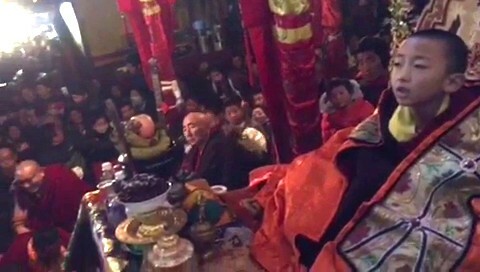 Many years have passed since I set up my first altar and updated Rinpoche about this first assignments. I miss that day very much, maybe because, at the time, I have not broken my promises out of laziness or doubt. If I can, I wish I can start all over again and do not mess up. 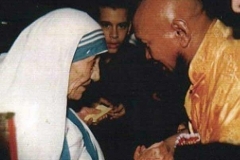 I am sorry that I have disappointed Rinpoche so many times. I am sorry that I did not put much effort in my Dharma study, I am sorry that I did not follow through with many of the instructions given to me, and thank you for not giving up on me.